It is no news that a new Injustice game with the moniker Injustice 2 is coming up soon, but a new twist has been added to the news. Actually, there are multiple twists. 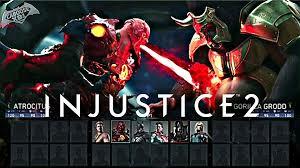 One is that a mobile version of the game will be coming out, just like the debut Injustice game. This was revealed recently at the Comic-Con event by Ed Boon, creative director at NetherRealm Studios, makers of the Injustice game. "I always describe the mobile game and the comic as the two children the game had that graduated and went on." From that statement, it is safe to conclude that every installment of the Injustice game will be released with a mobile game and comic. The mobile game and the comic will be released together, but since a release date has not been announced, it is not clear whether these will be released with the full PC game. The last twist to this story is an exciting one. At the Comic-Con event, it was also announced that two new playable characters, Wonder Woman and Beetle will be added to the game. With all these announcements and new twists to the upcoming game, it is quite clear that Injustice 2 will out-do its predecessor in terms of playable characters, platforms and in the story itself. The Comic-Con event is still on, so more announcements and details about the game are expected to still come out before the event ends. Perhaps the release date of the mobile Injustice 2 game and comic will be announced.